June is National Pet Preparedness Month which just happens to coincide with the start of hurricane season here in the southeast. Since hurricanes, and other natural disasters, can strike at any time it is very important for you and your pets to be prepared. Sleepypod is an Oz the Terrier Sponsor. 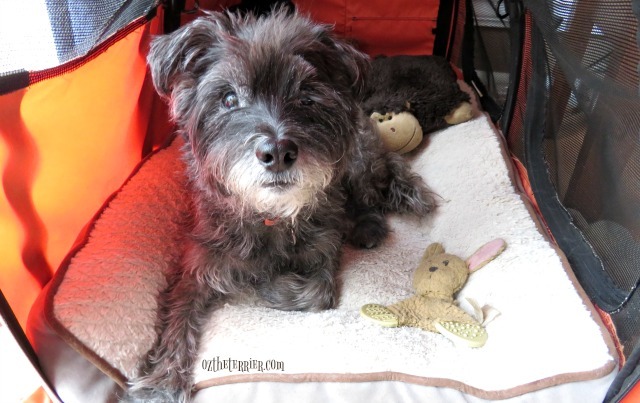 I am being compensated for sharing information about Sleepypod products but Oz the Terrier only shares information we feel is relevant to our readers. Sleepypod is not responsible for the content of this article. Our first hurricane season with Oz was in 2005. It was the most active Atlantic hurricane season recorded with five of the season’s seven major hurricanes making landfall – Dennis, Emily, Katrina, Rita and Wilma. Of those storms, Wilma was the hurricane that had the biggest impact and caused the most damage in our area. It was after Wilma passed, and we were without power for one week, that I learned the importance of being prepared. As pet parents, we cannot forget to stock up on essentials for our pets nor can we forget to provide them with the comfort and security they need during a disaster. We encourage all pet parents who live in disaster-prone areas to be prepared and follow these safety tips. 1. Make sure your pet has identification like an I.D. tag, a customized collar or microchip with current contact information. 2. Carry a photograph of your pet (or even better, of you and your pet) in the event of separation. 3. Stock up on needed pet supplies including food, water, medications, litter, bedding for small pets and first aid supplies. 4. Make a safe space in a crate or carrier for your pet to ride out the storm. Pets can sense severe weather changes and they will often hide. It’s best to create a secure space so you know where they are in case of evacuation. 5. 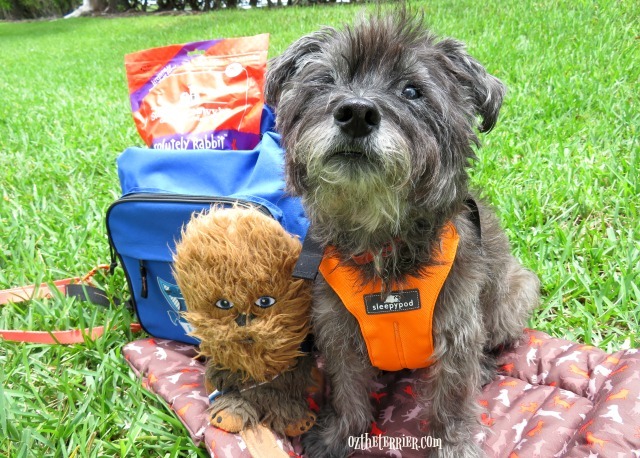 Create an Emergency Go-Bag for your pet in case of evacuation. Oz’s Go-Bag has food, water bottle, treats, collapsible food dishes, his vaccination record, an extra leash and harness, a favorite toy and a roll-up bed/crate mat. 6. 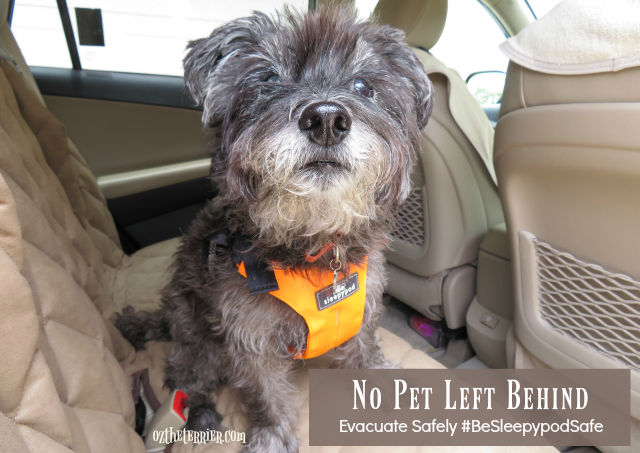 If evacuation is necessary, do not leave your pets behind and be sure to secure them in the car! If you used a crate or carrier as your pet’s safe place, then you can easily take them with you. You can also use a pet travel safety harness, like Oz’s Sleepypod Clickit Sport dog travel harness, to safely secure your pet in the vehicle during evacuation. 7. Know where you emergency shelter is located and call before a disaster to make sure they accept pets. You can find a wealth of information on how to make a pet emergency plan, how to protect your pet during a disaster and so much more on Ready.gov. 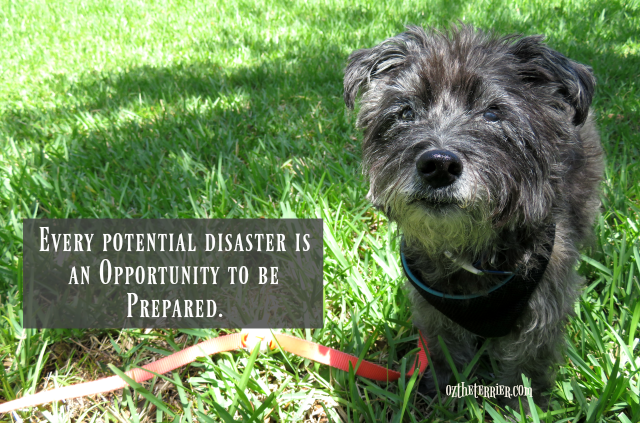 Have you experienced a disaster or hurricane with your pets? Great tips, we were hit here in New England by both hurricane Irene and Sandy, and I hope that never happens again! Great info, Oz! We wish you a non-eventful hurricane season! We don't get to many storms here. We are lucky. We aren't likely to ever get a hurricane here, but we get our fair share of severe storms and the occasional tornado. So the humans here are pretty good about being prepared to take care of us pets. But a great post like yours is always a good reminder. That's great advice. We're lucky that we don't have violent weather here.....just HEAT and drought. We did have flooding once, but we're on high ground. We always feel sorry for the animals we see on the News caught up in storms, flooding, or fires. Great reminder, Oz! As we live in Kansas, our preparedness is geared toward tornadoes. Mom and Dad have a plan - and caring for us is at the top of the list! We spend much of our time tracking storms and preparing the boat. We spent Joaquin in Maryland taking down canvas and investigating options for getting the boat out of the water if the storm came our way. We spent Matthew in Virginia with the boat up on stands. Luckily we only got 40 mph winds in Virginia. But it freaked me out enough that I couldn't sleep. So far we've been lucky and try to time our travels to lower our hurricane risk. But your post is a good reminder that I should create a dog and human plan as well as a boat plan. We have been through several hurricanes and hurricane warnings. Sid is the most affected by the wind and rain. I have a safe closet for them and we used it during Frances, Jean, and Wilma.